How Do I Configure My RaiseDonors Integration? The RaiseDonors integration for Virtuous will allow gifts to flow directly into Virtuous so they can be bundled and imported via the Gift Transaction tool. 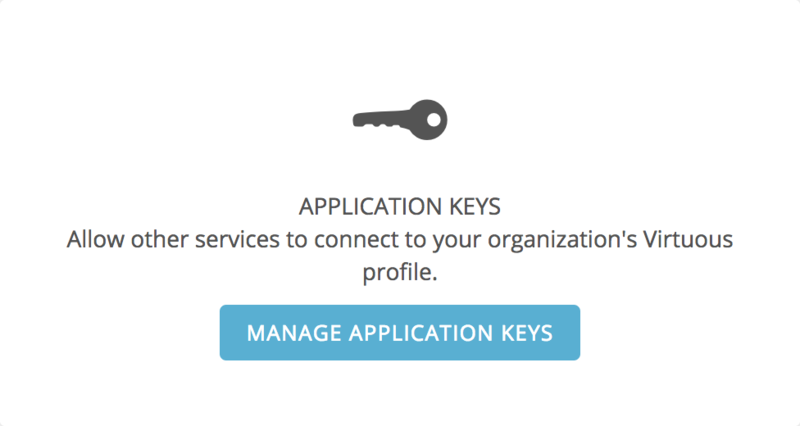 Click on the blue "Create an Application Key" button in the upper-right to add a new application key. Select "RaiseDonors" from the list of options. Copy the generated application key; you'll need to provide that information to your support representative at RaiseDonors. They will then set up and test your Virtuous connection. Once your RaiseDonors integration has been configured, you'll want to make sure that each of your giving pages includes Segment Codes and Project Codes that sync with the values already set up in your Virtuous instance. For more on syncing data between Virtuous and RaiseDonors, check out this help article from the RaiseDonors knowledge base.